The Bob Marley biography is the story of one of the most beloved and enduring artists in music. Although he died at a young age, his music lives on. He was incredibly influential in introducing reggae music to a wider audience and in drawing attention to issues of poverty and discrimination. Bob Marley was born Nesta Robert Marley on February 6, 1945, in St. Ann, Jamaica. As a child, Jamaican officials made an error when issuing him a passport, swapping "Nesta" and "Robert" and he went by Robert Nesta for the remainder of his life. Marley was the child of a white father who spent most of his time in Liverpool, England and a black Jamaican mother, who was most responsible for his upbringing. His father passed away when Marley was 10, and after that, his mother could no longer afford to stay in their St. Ann home, so they moved to Kingston's notorious Trenchtown neighborhood. There, Marley met some of the people and had many of the experiences that would later go on to influence his music - Trenchtown itself is mentioned in several Marley songs. In his late teens, Marley began moving into music, playing with friends Neville Livingston (Bunny Wailer) and Peter McIntosh (Peter Tosh). The three eventually formed a group with a few other friends that was initially called The Teenagers and went through several name changes, eventually becoming The Wailers. The group recorded some songs for producer Coxsone Dodd and the other members drifted away from the group until the core Marley, Bunny Wailer and Peter Tosh were left. Around 1966, Marley was forced to take a break from music after marrying Rita Anderson and moving to America, where his mother now lived. He took a job in the DuPont factory in Delaware briefly under an assumed name. The experience had a lasting impression on Marley, and he soon returned to Jamaica and began to study the Rastafarian religion that would shape the rest of his life. On returning to Jamaica, The Wailers reformed and worked briefly with Lee Scratch Perry. After a fallout with Perry, the group finally found a home on JAD Records and began to attempt to promote their music internationally. During this time, they released the albums Burnin' and To Catch a Fire, which earned respectable sales around the world. Despite the appearance that they were on the track for success, The Wailers broke up in 1974. The reason for the split remains a matter of debate; some say it was because of fighting between the musicians and others claim that each felt it was simply time to try solo careers. After the original Wailers split, Marley kept the name for his band (which by now contained wife Rita as a backing singer) and began presenting himself as a solo act. It was during this period that he found real international stardom. 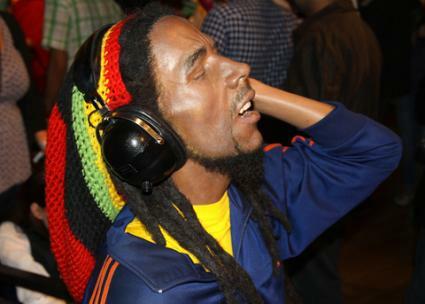 Many of his songs made the charts in the U.S. and around the world, with No Woman No Cry becoming his biggest hit song. Marley also became heavily involved in politics during this time. He performed at a concert in Jamaica designed to make peace between feuding political factions, and he and Rita were both shot. He remained deeply involved in both Jamaican politics, and increasingly he became a champion for the causes of people in Africa. In 1977, doctors discovered cancer in Marley's big toe when they were treating him for a sports injury. Rastafarians often eschew medical treatment and do not believe in amputations, so Marley refused to allow the doctors to amputate the toe to remove the cancer. By 1980, the untreated cancer had spread all over his body, including his brain. He decided to go home to Jamaica for his final days, but during the journey became very ill. His plane landed in Miami and he died there. His body was taken to Jamaica for burial.